Meryl Streep had some technical difficulties that resulted in loose lips during her Golden Globes acceptance speech for her Best Actress in a Motion Picture award for "The Iron Lady," and she owned up to it backstage. "I said sh** on TV! I did," she told Access Hollywood's Billy Bush backstage at the Globes, when asked about the moment when the censor button cut in during Sunday's telecast. "You did," Billy responded. "Twice." 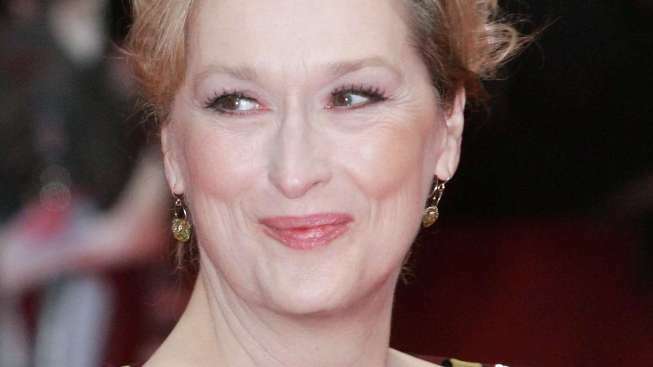 "I said [it] and I don't normally say — well, I do normally say that, but I don't say it on TV," Meryl said. The actress admitted her inability to read her acceptance speech helped lead her to curse. "What made you say [it]? The glasses?" Billy asked. "My glasses. I have such a good speech in my pockets," she said. While she didn't get to read her speech on stage, improvising instead, Meryl gave Billy some of the details backstage. "I had everybody's name that I wanted to mention and so as a result, I forgot and I'm apoplectic but what are you gonna do?" Meryl shrugged. "I'll have to now email everybody and that's just gonna take days."